On 17th July, the BUND Naturschutz (the largest environmental organisation in Germany) and the “AufgeMUCkt” Action Alliance handed in a petition to the state parliament against the construction of a third runway at Munich Airport. Nearly 80,000 people have signed the petition from all over Bavaria. The petition was handed to the Chairman of the Economic Committee (CSU) and someone from the Environment Committee at the parliament. The campaigners asked the politicians to please take note of the will of the people and decide against allowing a new runway. One campaign leader, Helga Stiegl Meier explained that, among other things, the number of aircraft movements at Munich Airport has been stagnant for years, which she said proves that there is no need for a 3rd runway. Another spokesman said the region has no need of furher aviation expansion, and sustainable transport in Bavaria is facing very different challenges, such as future supplies of cheap oil.The new parliament will have to decide after the state elections in the autumn on a third runway. On 17th July, the BUND Naturschutz (the largest environmental organisation in Germany) and the “AufgeMUCkt” Action Alliance handed in a petition to the parliament against the construction of a third runway at Munich Airport. Nearly 80,000 people have supported the petition with their signatures. “Nearly 80,000 people from all over Bavaria have signed this petition against a third runway and runway at Munich airport, we give you today.” With these words, Hartmut Binner and Helga Stiegl Meier presented as speaker of “AufgeMUCkt” the petition to State Parliament Erwin Huber , the Chairman of the Economic Committee (CSU), and the Landtag Christian Magerl, the orsitzenden of the Environment Committee (Alliance ’90 / The Greens) in the Bavarian state parliament. “Mr. Huber, please note these will of the people and finally the Munich public decision against a third runway,” called Binner. Huber promised those present that the petition was being treated objectively, but referred to the course of justice, “but here all your objections are extremely thoroughly tested, evaluated and weighed, as it did in the previous planning approval process. We have to wait and see. “He also stressed that the economic committee is only on 20 June has spoken in the treatment of the country’s development program (LEP) for a third runway and its inclusion as a goal in the LEP. Erding – 80,000 people from all over Bavaria have signed a mass petition against the third runway at Munich Airport. On Wednesday, the packages were passed in parliament. © Hans MoritzSurrender before the Maximilianeum: Hartmut Binner, Stiegl Helga Meier, Christine Margraf, Christian Magerl and Manfred Drobny present the mass petition to Erwin Huber (right). Given poor half-year figures in the Erdinger Moos feel the expansion opponents upswing. The collection of signatures for the petition had Green, the nature conservation as well as the initiatives of citizens over 80 “AufgeMUCkt” started when the advertising of the citizens’ initiative started off in Munich. “Eighteen months ago we wanted to be prepared especially for the event that we lose in Munich,” says Helga Stiegl Meier, Green Party parliamentary candidate and “AufgeMUCkt” spokeswoman. The Earth’s Gerin had gone with her colleague Hartmut Binner Speaker, the Deputy Christian Magerl and Christine Margraf and Helmut Drobny from BN in parliament on Wednesday. 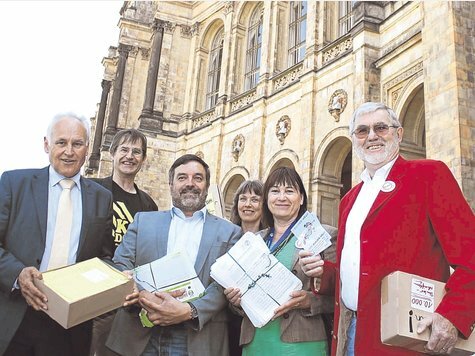 There, they delivered on the last day before the last summer break before the election on 15 September 80 000 signatures bundled in boxes to Erwin Huber (CSU), the Chairman of the Economic Committee. 40 million passengers per year were also a large number. Drobnys to criticism of unbridled growth Huber said: “We are facing major demographic challenges, make the necessary investments in infrastructure. Growth provides us the means. “Who will refuse that must be restricted. Erding – 80.000 Menschen aus ganz Bayern haben eine Massenpetition gegen die dritte Startbahn am Flughafen München unterschrieben. Am Mittwoch wurden die Pakete im Landtag übergeben. Angesichts schlechter Halbjahreszahlen im Erdinger Moos spüren die Ausbaugegner Aufwind. Die Unterschriftensammlung für die Petition hatten Grüne, Bund Naturschutz sowie die über 80 Bürgerinitiativen von „Aufgemuckt“ gestartet, als die Werbung für das Bürgerbegehren in München anlief. „Vor eineinhalb Jahren wollten wir vor allem für den Fall gewappnet sein, dass wir in München verlieren“, berichtet Helga Stieglmeier, Grünen-Landtagskandidatin und „Aufgemuckt“-Sprecherin. Die Erdingerin war am Mittwoch mit ihrem Sprecher-Kollegen Hartmut Binner, dem Abgeordneten Christian Magerl sowie Christine Margraf und Helmut Drobny vom BN in den Landtag gefahren. Dort übergaben sie am vorletzten Tag vor der letzten Sommerpause vor der Wahl am 15. September die 80 000 Unterschriften in Kartons gebündelt an Erwin Huber (CSU), den Vorsitzenden des Wirtschaftsausschusses. Huber sicherte zu, „dass wir die Petition im Ausschuss ernsthaft prüfen werden“. Dies werde aber erst in der neuen Legislaturperiode geschehen, „da wir zunächst das Urteil des Verwaltungsgerichtshofs abwarten“. Die Gegner, die im Prozess gehört würden, könnten sicher sein, „dass alles ernst und gewissenhaft abgewogen wird“. Der frühere Finanz- und Wirtschaftsminister sowie Ex- CSU-Vorsitzende machte aber auch klar, „dass sich Ausschuss und Plenum erst im Juni mehrheitlich für die Expansion ausgesprochen haben“. Magerl hielt ihm entgegen, „dass es uns nicht nur um das Urteil geht, sondern auch um die Entwicklung, die wir seit Einreichen der Klage erleben“. Wenn Huber den Bürgerwillen ernst nehme, komme er um die 80 000 Unterschriften nicht herum. „Die sind kein Pippifax“, attestierte Huber, „aber auf der anderen Seite stehen zwölf Millionen Bürger, die die Politik zu vertreten hat“. 40 Millionen Passagiere pro Jahr seien ebenfalls eine große Nummer. Zu Drobnys Kritik an grenzenlosem Wachstum sagte Huber: „Wir stehen vor großen demografischen Herausforderungen, die Investitionen auch in Infrastruktur nötig machen. Wachstum beschert uns die Mittel.“ Wer das ablehne, müsse sich einschränken. Posted: Wednesday, July 24th, 2013. Filed in General News, News about Airports, Recent News.